The usually quiet town of Gweru burst into life last Saturday when it hosted the inaugural Gweru Carnival where Gusheshe drifters were the main attraction. The show, which started later than anticipated owing to technical challenges, brought the City of Progress to a standstill as it was ideally held in the central business district. Organised by Rock Zimbabwe Festival Series and the Zimbabwe Tourism Authority, the carnival saw carnivalists strutting their stuff in funky outfits. Up-and-coming Gweru musicians were not to be outdone as they also took advantage of the fete to showcase their talent. 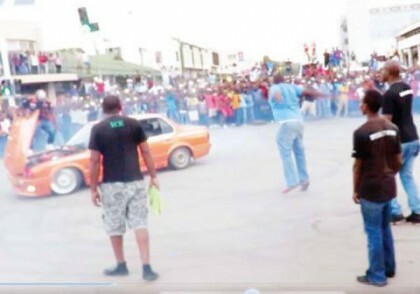 The day, however, belonged to the Gusheshe drifters who stole the show by skillfully drifting and spinning their cars, much to the crowds' amusement. Once people heard the noise from the cars and recognised the smoke, they could not help but quickly join in on the fun and witness the spectacular act. "As Gweru residents, we appreciate the effort put by organisers. They brought something that's new and different. What made this event special is that it was more of a family show as I managed to bring my wife and kids and we had a good time. We really need more events of this nature in order to bring back the fun into the city." he said. However, the fun was spoilt by the police who ordered show organisers to end the carnival just before 10PM saying they had not been fully cleared to hold the event. As a result, an after party where revellers would have been expected to pay to enter was not held, costing organisers $9,000. "The police pounced on us and ordered us to stop the event saying we didn't have sufficient paperwork/clearance from council. Though the event was going on well, we ended up losing a lot of money as a result of this hiccup," one of the organisers, Esau Hondora, said. He said an estimated 4,000 people had attended the day show. Hondora revealed plans to host another carnival in Bulawayo later this year. "The Gweru carnival was a learning curve for us and we're not ending here as we're planning to take this concept to Bulawayo in September this year.